Before the GCC summit in Kuwait in December 2013, Oman’s minister of foreign affairs, Yusuf bin Alawi bin Abdullah, made a surprising statement: his country would not join a GCC union (an upgraded version of the current loosely organized GCC) proposed by the Saudis, saying “we should not enter into conflicts, either close or far away from us. We think we should not return to the previous century.” Oman, one of the founding states of the GCC in 1981, which was established primarily as a counter force against Iran, seemed, with this statement, to distance itself from a confrontational stance towards Iran. That hostile position, led by Saudi Arabia, has increased since the recent rapprochement between the United States and Iran. Moreover, as much as GCC states see Iran as a threat, member states fear the influence of fellow members, particularly Saudi Arabia. In 2009, a GCC monetary union, with its headquarters to be located in Riyadh, was turned down. Oman has taken this opportunity to resist another Saudi initiative. While Bin Alawi’s statement may be surprising, given that Sultan Qaboos in January 2014 ratified the GCC Security Pact (strengthening cooperation on security matters), it also reflects Oman’s record in foreign policy and its reluctance to take sides. Oman has long resisted following the confrontational position of Saudi Arabia and other GCC states towards Iran. While the latter (Saudi Arabia, Bahrain, and, to a lesser extent, Kuwait) have often accused their Shia population of being agents of Iran, Oman has not pursued such a confrontational position towards its own Shia minority. 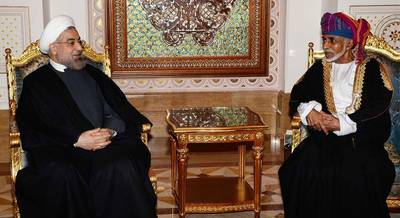 By rejecting the GCC Union, it has chosen diplomacy over confrontation. Oman has long played a distinctive political role in the region, taking seemingly contradictory positions on regional issues. The sultanate maintained bilateral relations with both Iraq and Iran during the Iran-Iraq War, unlike other GCC states, such as Kuwait and Saudi Arabia, that supported Iraq and opposed Iran. Oman did not break ties with the Islamic Republic after the Islamic Revolution in 1979, despite regional concern over the export of the Revolution throughout the Gulf. At the same time, it intensified its security alliance with the United States, in order to ward off the perceived Iranian threat. During the Iraqi occupation of Kuwait, Oman was the only Gulf state to maintain diplomatic relations with Iraq. Yet, it cooperated militarily with the United States to liberate Kuwait. Likewise, Oman publicly opposed the US military invasion of Iraq in 2003, while nevertheless providing military support. As in Gulf security matters, the sultanate took an independent and pragmatic position toward the Arab-Israeli conflict, when, in 1979, it decided not to break relations with Egypt after President Sadat signed a peace treaty with Israel. This was against the tide of Arab public opinion and the Arab League’s decision to break diplomatic ties with Egypt. Oman also began, after the Oslo Accord in 1993, to explore economic and limited political relations with Israel. From that time, Oman played a leading role among Arab states in trying to build a diplomatic bridge with Israel. The sultanate became the first Gulf state to host Israeli Prime Minister Yitzhak Rabin, and Israel and Oman later opened trade offices (which were closed after the Second Intifada). 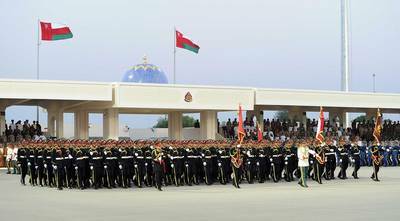 In the past decades, Oman has also emerged as a neutral and discreet mediator. The sultanate arranged prisoner exchanges between Iran and the United States and helped to organize oil payments to Iran during the international sanctions imposed against Iran’s industry due to its nuclear program. It also encouraged a diplomatic solution to the crises between Qatar and Bahrain in 1986 and between Iraq and Kuwait in 1990. More recently, in the wake of the deal between Iran and the West on Iran’s nuclear program in November 2013, the Associated Press reported that secret talks had been held between US and Iranian officials in the capital, Muscat, in March 2013. These talks were made possible after Sultan Qaboos played a key role in facilitating the release of three American hikers detained in Iran in 2009; Qaboos later offered himself as a mediator for a rapprochement between the United States and Iran. In March 2013, US Under Secretary of State Nicholas Burns and other senior US officials met with Iranian diplomats, national security aides, and experts on the nuclear issue. Further secret meetings, held after the election of the reformist Hassan Rouhani as president of Iran, produced much of the interim agreement that was later formalized during negotiations in Geneva. Oman had thus facilitated the talks that prepared the ground for an expeditious deal in Geneva. Oman’s historically good relations with Iran centre on a shared responsibility for the Strait of Hormuz—through which about one-third of the world’s oil supply is being shipped—and trade between the two shores of the Strait. In the 1970s, troops sent by the shah of Iran had helped the sultan put down the communist-inspired Dhofar uprising. This support was not forgotten, even after the Islamic Revolution. Sultan Qaboos was the first foreign leader to visit Iran’s new president, Hassan Rouhani, after he took office on 3 August 2013. 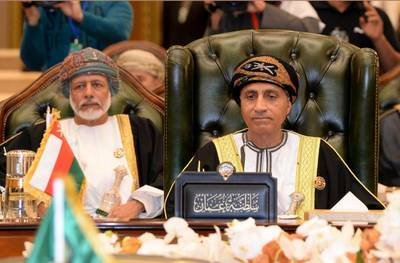 Both leaders agreed to intensify trade and economic relations; Oman realized the need to promote trade with Iran, in its effort to diversify the economy away from oil. During Rouhani’s visit to Muscat in March 2014, Omani and Iranian officials signed a three-year deal that will see Oman supplied with 30 million cubic meters a day of Iranian gas through a $1 billion pipeline. The gas cooperation will enable Oman to meet its domestic demand; for Iran, it will be a welcome source of income, as the Iranian economy has long suffered from international sanctions. A condition of this independent and pragmatic foreign policy towards regional neighbours and the prevention of foreign interference by those neighbours has been the maintenance of a special relationship with Great Britain and the United States. Although British forces had officially left Omani bases in 1977 (after the Dhofar War was won), the regular renewal of military cooperation agreements with both Great Britain and the United States confirmed Oman’s alignment with US and British policies. After the terrorist attacks on US targets on 11 September 2001, the US military presence in Oman increased dramatically, from about 250 to 4300 personnel. Oman supported US military operations in Afghanistan (2002) and Iraq (2003). The bases in Seeb and on Masirah island were the only ones in the Arabian Peninsula used by the coalition during the air offensive against Iraq, as they had been in 1991. According to Marc Valeri, senior lecturer in political economy of the Middle East at the University of Exeter (United Kingdom), this partnership is the key to Sultan Qaboos’s freedom of action in the region, but it comes at a huge financial cost. Omani defense purchases from the United States and Great Britain have led to high military expenditures: 11.3 percent of GDP in 2013 (15.8 percent in 2012), compared to 8.3 percent in 2010, the highest rate in the Middle East (source: Stockholm International Peace Research Institute). Oman’s unique position in the Gulf, in its quest for political and regional stability, goes back to the foundation of Omani society. As the only Arab country that has had a colony in the past, Omani society has a longtime presence of diverse ethnic and religious groups, including Omani nationals of Baluchi, Zanzibari, and Indian descent. This has fostered a high degree of tolerance and an outward-looking mentality. The unique Ibadi religious tradition discourages sectarian and ideological conflicts and prefers the moderate way (reflecting the way Imams were traditionally chosen during the period of the Imamates). Increasing sectarian tensions in the Gulf threaten to undermine this foundation.